Alex Ream-Sapiano had two choices once his vehicle was pinned: Stay warm in his vehicle, or go outside in the cold for an unknown amount of time. PORTLAND, Ore. — Roads were icy Saturday morning after parts of Portland were blanketed with snow hours earlier. Perhaps the most notable crash involved a Love’s fuel truck on the ramp from southbound Interstate 5 to Interstate 84. Pinned between the fuel truck and the guardrail was a maroon SUV driven by Alex Ream-Sapiano. The crash occurred around 6:30 a.m.
Ream-Sapiano told KGW’s Pat Dooris the crash happened after a vehicle about six cars ahead of him spun out. He said everyone had slowed to a stop. “Then I looked in my rear-view mirror, saw the semi was coming and not slowing down,” Ream-Sapiano said. Ream-Sapiano said he and other drivers tried to get out the semi-truck driver’s way but it didn’t matter. “The back end of the semi came out from behind him and hit me,” he said. At first, it seemed the crash could be cleared quickly. But Ream-Sapiano was pinned in too tightly between the semi-truck and guardrail. For Ream-Sapiano, he had two options: Stay warm in his vehicle, or go outside in the cold for an unknown amount of time. He chose the former. “I could have gotten out of the car anytime I wanted to. I just didn’t want to leave my heater,” Ream-Sapiano said. 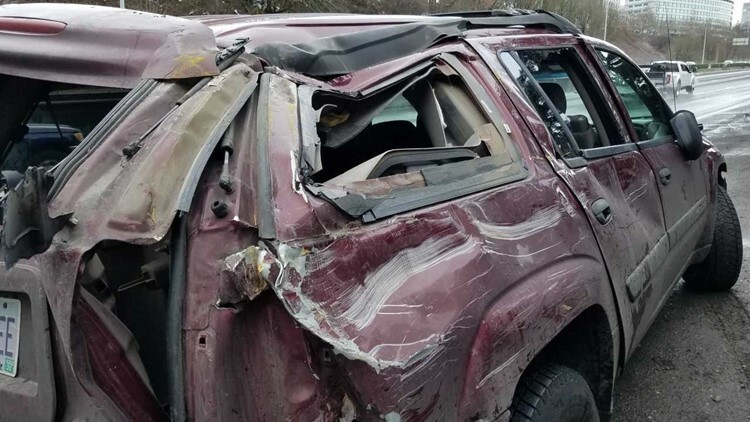 After hours of staying in his SUV, Ream-Sapiano climbed out of the driver’s side window, with the help of the first responders and fencing on the guardrail. Eventually, other drivers behind the crash were able to back down the freeway ramp and clear the road. That allowed a tow truck to come from behind and lift the Love’s semi-truck, freeing up Ream-Sapiano’s SUV. Five and a half hours after being pinned, Ream-Sapiano was able to drive away.